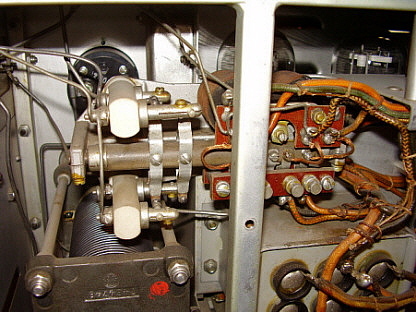 photo above: The General Electric BC-375-E transmitter shown with the BC-306-A LF Antenna Tuner. photo above: The BC-191 set-up for AC operation within a building. Note the interface that allowed "patching" telephone line audio into the transmitter. Also, the CW keys, the T-32 mike and the mill (although this might just be a regular typewriter.) The receivers are all BC-342 types. >>> Commonly used on B-17s, the SCR-287 (the combination of BC-375 and BC-348 receiver) set-up was found on thousands of those bombers. On the B-17, the transmitter was usually located under the radioman's table while the receiver was on top of the table. Other installations had the transmitter on the opposite side of the fuselage from the radioman's position. Installations did vary from plane to plane but it illustrates the importance of the receiving operation versus the transmitting function. Most BC-375 transmissions were very short - a word or two was all that was necessary. Nearly all transmissions were in CW. Voice was rarely used. Additionally, only those items necessary for operation on the specified frequencies were taken on a bombing mission. On other types of airplanes, such as transports or search and rescue types, more equipment may have been taken along since the mission might require more specialized communications than the typical bombing run would. 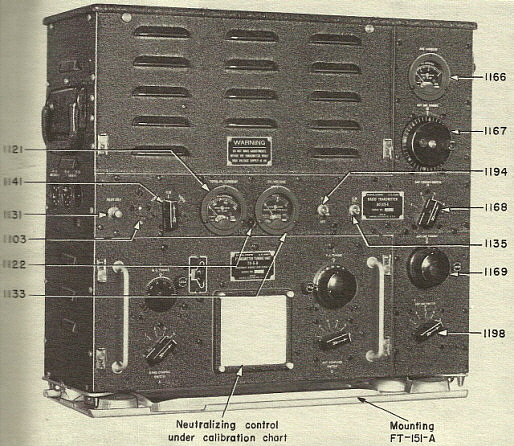 The BC-191 was primarily used as a field transmitter or for fixed radio set-ups in buildings. The very early versions don't have the antenna tuning section located on the right side of the transmitter but the basic concept of a simple MOPA transmitter using four large 211 tubes was present on those early versions. Sometimes the BC-191 was also used in vehicular applications. The BC-191 operates on +14vdc and can be powered by the typical battery-charger running the PE-53 dynamotor or it can also be operated using the AC powered RA-34 power supply. The BC-191 was used on Voice more often than the BC-375. There were other accessories for the BC-191 that allowed interfacing a telephone system into the transmitter. See the photo below-left showing the BC-191 setup with the RA-34 AC power supply, the BC342 receivers and the telephone interface with handset and T-32 carbon mike (also note the J-36 and J-38 keys.) 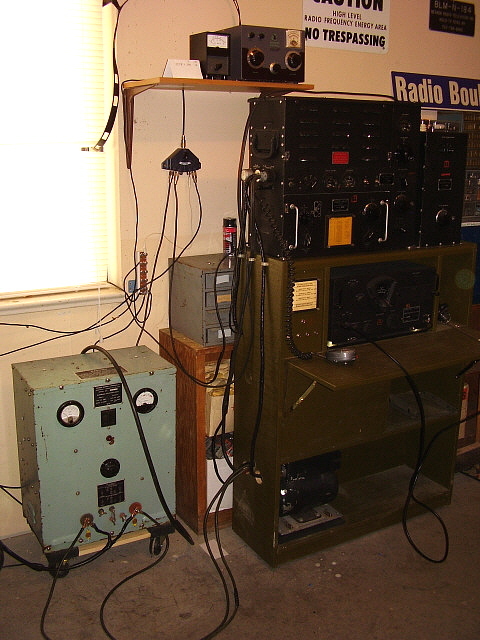 The Army found the BC-191 to be a more versatile transmitter and many were still in use post-WWII. The BC-375 rapidly became outdated for aircraft use, especially towards the end of WWII. Certainly the decision to build 100,000 transmitters was based on the planned requirements early in the war. Towards the middle of WWII, the radio engineers had come up with the ARC-5 series of transmitters-receivers and Collins Radio Company had introduced their famous and very modern ATC/ART-13. These transmitters produced more RF power in smaller packages and didn't require several tuning units for frequency mobility. Additionally, the ATC/ART-13 would autotune itself and had superb audio. These new transmitters were installed on the newest types of bombers while BC-375s were still being delivered. Near the end of WWII, crates of BC-375s were left unopened because the military viewed the transmitter as obsolete. However, that view was for bombers. The military still used the BC-375 in transports and in "search and rescue" planes well after WWII. They weren't the "latest and greatest" but they were reliable and worked well in those areas. Even though some BC-375s were installed on some types of aircraft during the Korean War, there were still thousands that remained in unopened crates in many locations. The BC-375 became available surplus immediately following the end of WWII. Though they cost the government $1800, the surplus market offered complete BC-375 transmitters with all accessories, all new in the crate, for around $40. All of the accessories were offered separately for only a few dollars each. These incredibly low prices attracted the attention of budget-minded hams and many bought the complete set-up as a "cheap way" to get "on the air." Probably some of the hams remembered that the BC-375 had been used successfully in B-17 bombers and since the superbly designed BC-348 receiver had also been in the B-17, well,...the BC-375 must be just as good. Since the BC-348 was relatively easy to convert to amateur use, it followed that the same must be true for the BC-375. Unfortunately, the hams were usually limited in their ability to power up the BC-375 with an adequate power source and operational problems ensued. Within a few years, most dealers were aware that the hams were having trouble with the BC-375 and began advertising that they were great sources for parts. Prices dropped accordingly and more hams bought the BC-375 to try it out as a ham transmitter. In the post-WWII environment when television signals were on the increase and everyone received their TV signals via antenna. 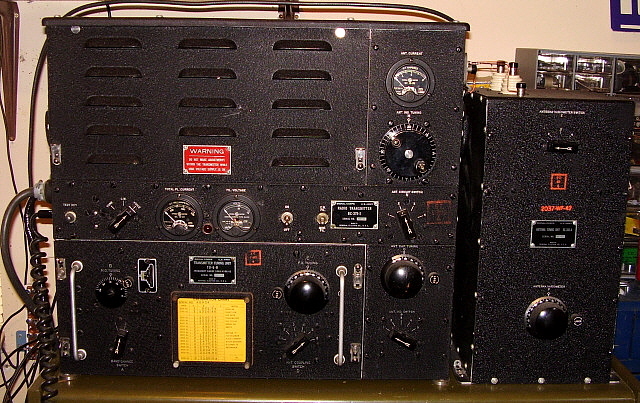 TVI became rampant mainly due to the transmitter's pre-WWII design as an aircraft transmitter (or field transmitter for the BC-191) and the very specific voltage and current requirements for proper operation. The BC-375 wasn't a ham transmitter and never would be. Eventually, the BC-375 garnered a reputation as an unusable relic that was only good for parts with CQ magazine's Surplus Conversion Handbook advocating that the BC-375 Tuning Units were particularly good for antenna tuner parts or other "home brew" amateur project parts. Most hams believed the Surplus Conversion Handbook's assessment of the BC-375 and many were "parted out" with only the "useful" parts saved. As a result, original and unmolested BC-375 had become a rare item by the 1990s. As more and more hams became interested WWII surplus radio equipment with the intention of actually operating that equipment as originally as possible, the BC-375 was given another look. Maybe it might be possible to operate this "beast" without enduring endless criticism of the signal. 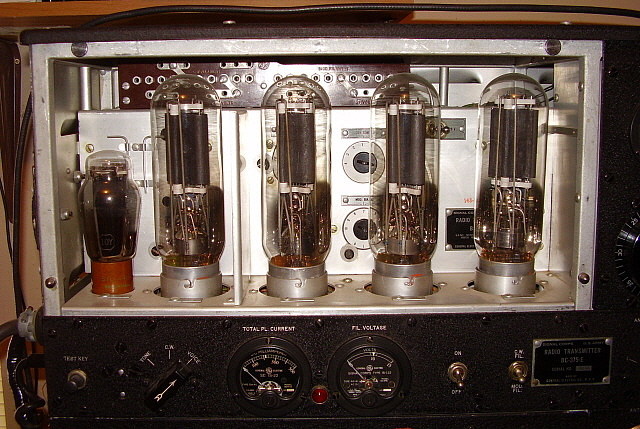 The BC-375 uses a total of five vacuum tubes. Four tubes are VT-4-C triodes (type 211E) along with a single VT-25 (10Y) triode. The first tube (left to right in the photo right) is the VT-25/10Y which is the speech amplifier in VOICE mode, the 1000hz oscillator in TONE (MCW) mode and the sidetone oscillator in CW mode. The second tube is the VT-4 that is used as the Master Oscillator. The third tube is the VT-4 used as the PA. The remaining two VT-4s are the P-P Modulator tubes. Operating voltage is provided by the aircraft battery/charger system (+28vdc) that is used for the low voltage requirements in the transmitter and also used to power the PE-73 dynamotor that provides the high voltage (+1000vdc) to the transmitter. Lower B+ voltages are derived from resistive dividers operating from the +HV. The transmitter frequency range is determined by which of the seven Tuning Units is installed in the transmitter. The coils and condensers and connections for the MO and PA are contained in each TU. The range of frequencies is from 200kc to 500kc and from 1500kc up to 12500kc using the seven various TUs. The controls aligned vertically on the right side of the transmitter make up the wide range antenna coupler for the transmitter. The separate Long Wave tuner, the BC-306-A, is usually located to the right of the BC-375. The BC-306 allows a further extension of antenna matching ability below 800kc using the typical trailing wire antenna (200 ft. maximum length deployment.) Power output is between 50 watts and 90 watts. The BC-375 provided full break-in keying by allowing the elaborate internal antenna relay to control the receiver antenna and the receiver standby circuit. Additionally, external inputs via the PL-64 cable allowed remote receiver standby, side tone, remote microphone and key operation along with remote power control. The aircraft was usually set-up to allow the pilot to also have the ability to access the transmitter/receiver for various reasons. The photo to the above-right shows the tube compartment of the BC-375. Note at the top of the compartment is the adjustable link board that sets the proper tube filament voltage for either +24vdc operation or +28vdc operation. The toggle switch behind and between the rightmost tubes is the voltage selector switch. The adjustment between the 10Y tube and the VT-4 Master Oscillator tube is the Microphone Gain control. The controls between the PA tube and the left Modulator tube are the Side Tone Level (top) and the Modulator Bias Level (bottom.) When CW is selected using the bar knob (with the arrow indicator) only the 10Y tube and the MO and PA VT-4 tubes are in operation. The modulator tube filaments are turned off. When TONE or VOICE is selected, all tubes are used. If trouble developed during a flight with one or two of the VT-4 tubes, it was possible to operate the transmitter on CW with only three tubes - the 10Y, the MO VT-4 and the PA VT-4. The photo to the left shows the BC-375 with the back cover removed. The entire left side of the chassis (when viewed from the rear) is the wide range antenna coupler. Top center to right is the large tapped resistor that is used for the proper filament voltage settings via the adjustable links. The large cans in the center are the audio input transformer and the modulation transformer. The TU is plugged into this BC-375 so the bottom metal case is the rear of the TU. In the upper left (and in both compartments) is the elaborate antenna switching relay that also accomplishes the remote receiver standby function. The ball contacts on the left side are for the antenna switching between transmitter and receiver while the right side of the relay has the flat contacts for receiver standby and some of the transmitter functions. This relay nearly always needs to be tested, cleaned and adjusted before it will work correctly. This is mostly due to dirt and minor corrosion on the contacts. This photo above shows a close-up of the sending relay. Note the rotating central shaft carries the arm contacts for each individual switching function of the relay. Shaft rotation actuates the contacts. For decades, the BC-375 was thought of as unusable and certainly many were destroyed for parts or irreversibly modified in an attempt to make them into a ham transmitter. The TVI issue eventually went away with strong cable and satellite TV signals. Modern digital TV is not even aware of an operating BC-375. Other problems that prevent successful operation of the BC-375 come from its specific power requirements. Onboard the airplane the transmitter operated on the battery-charger system that provided a solid +28vdc at almost unlimited current availability. Hams tried to run the transmitter on series-connected car batteries with only limited success. Audio distortion due to non-symmetrical modulation and FMing of the signal was common. Additionally, many of the BC-375s were being used with non-matching serial number Tuning Units (TU.) The lack of specific TU to transmitter neutralization caused parasitic oscillations that also distorted the audio output. Well,...there was always CW. Even here the BC-375 stability due to insufficient power supply current caused raucous chirp and rapid drift. Maybe the BC-375 was just what everyone thought,...unusable. By the 1990s, the vintage military radio collector groups were on the increase and the BC-375 was viewed with interest because of its importance in aircraft communications during the early parts of WWII. Several ham-collectors worked on the problems of why the BC-375 seemed to be impossible to operate without "FMing" and poor quality audio. By careful neutralization of each Tuning Unit and use of robust battery/charger systems along with not trying to get maximum carrier power out of the transmitter, the resulting signals were pretty good. At least, good enough to encourage more military collectors to try the BC-375. Today, several BC-375 transmitters are being operated on the 75 meter ham band with notable success. Now,...the signals aren't Broadcast Quality Audio and the carrier power is relatively low but the signals are respectable and have what has become known as "the BC-375 sound." One word of caution though,...when operating a BC-375 or BC-191,...stay on vintage military radio nets or have QSOs with experienced vintage military radio operators. These hams know how the transmitter should sound when operating correctly and will not force you to endure endless audio critiques that are meaningless to the BC-375/BC191 transmitter's abilities. 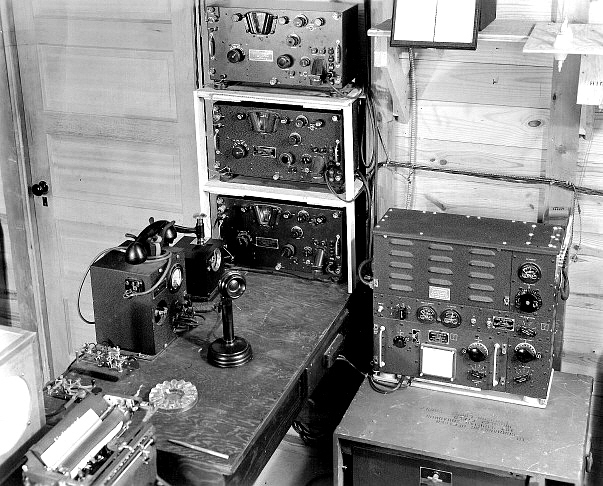 In Virginia City (photo below) - The SCR-287 comprised a complete liaison radio station installed onboard various bombers and transports during WWII although it didn't look like the station shown in the photo below. I built the olive-drab desk set-up to better display the station for the Western Historic Radio Museum. Besides the BC-375, the BC-348-Q receiver (dynamotor operated,) the Lionel J-47 telegraph key and the Shure Bros. carbon microphone, the T-17. The speaker is an LS-3, although these were never used in the SCR-287 or onboard the aircraft. 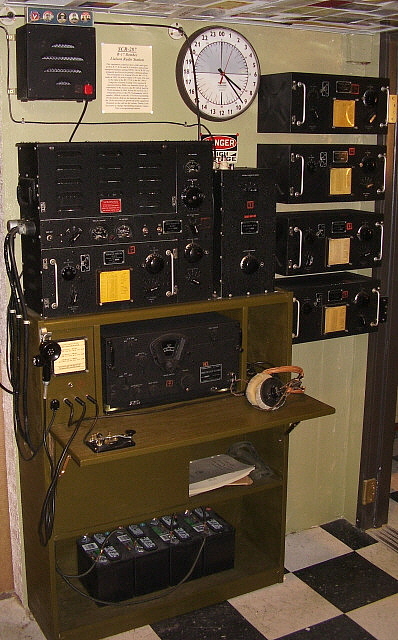 Four BC-375 Tuning Units are mounted in their CS-48 containers on the wall. The home made console features a fold-down desk, a sound-proof (almost) compartment for the PE-73 dynamotor and a bottom shelf for the four storage batteries (four 12v batteries in series-parallel = 24vdc.) The panel to the left of the BC-348 has all of the remote connections for receiver audio output, receiver stand-by, xmtr CW sidetone select, xmtr microphone input and xmtr key input via the PL-64 connector. This station was on display in the museum until I closed in 2012. In Dayton, Nevada (photo below) - Nowadays, this SCR-287 is set-up in our work shop in Dayton. We eliminated the batteries and went to a PP-1104-C high current power supply. I moved the PE-73 to the lowest shelf of the desk for better stability since the batteries were removed. I also installed casters on the desk so I could move it around the shop easily. I rebuilt the power cable into a fully shielded cable. The same shielding method was done to the BC-348 cable and to the auxiliary cable that is used for the remote standby and for the sidetone. With the new set-up, I no longer use the LS-3 but have switched over to a 600 Z ohm headset which greatly reduces the noise from the PP-1104 and the PE-73 dynamotor (it's still noisy even in the sound proof box - which is open for the photo.) I'm also using a Shure Bros.102-C microphone now instead of the T-17. I still have to remount the J-47 key. Also, the 24hr clock is on the wall, just out of the "shot." The PP-1104 provides +28vdc with plenty of reserve current available providing a signal that is stable with no FMing and carrier power can be raised up to 75 watts with no problems. Why Using +24vdc Input Voltage Causes So Many Problems - The majority of the problems encountered when operating the BC-375 are due to using a power source that is incapable of remaining stable under load. The original aircraft installation ran on batteries that were constantly being charged with the generator system of the airplane. This meant that a constant +28vdc was supplied with practically unlimited current available. There is no doubt that the BC-375 operates as designed and more efficiently on +28vdc rather than +24vdc, even though there is a internal switch to allow proper filament voltages when in the +24vdc position. However, the +24vdc switch was only provided for pre-flight set-up and not for in-flight operation (per the manual.) The design intended the transmitter to properly operate on +28vdc. The problems encountered when running on +24vdc are due mainly to the inefficient operation of the PE-73 dynamotor at that low of a voltage. At +24vdc the PE-73 is rotating slower than at its design RPM. This low RPM results in a lower output voltage and also affects that voltage's stability under load. The stability issue is mainly due to reduced inertia that the rotating armature has operating at +24vdc. Additionally, the output voltage of the PE-73 will be in the low +900vdc range and subject to wide swings in that voltage output dependent on the transmitter's load variations. This ends up with two transmitter operational problems, "FMing" and non-symmetrical modulation. Most of the following suggestions are for operation of the BC-375 on a battery system alone - no charging system - with the transmitter set for +24vdc operation - in other words, for pre-flight conditions. During the pre-flight set-up, the fact that the BC-375 FM'ed wasn't important, neither was the non-symmetrical modulation - "pre-flight" just a test set-up to make sure the BC-375 was on frequency and working correctly before the airplane took off. It's very difficult to overcome the problems encountered in a pre-flight set-up, but it can be done. Remember that batteries alone will only charge up to about +26.5vdc maximum and that voltage drops very rapidly with the BC-375/PE-73 in operation. Most of the transmitter's time will be operating at +24vdc or less. Building the Cables for Low Noise Also Will Help - Most of the time the BC-375 is found without the power cables. The +HV cable is readily available from Fair Radio Sales or other sources but the +LV cable isn't and usually has to be built. Luckily, the PL-61 connector is relatively easy to find but you will need two of them. Use 12 gauge stranded wire (hook-up wire) for all wires in the cable and make the cable length around four to five feet long. It's very important to make sure that this cable is shielded. I use braided shielding removed from old RG-8 coax cables for shielding. Push the ends of the shield together to expand it and then sleeve it over the cable and then pull the shielding tight by pulling it through your hand. Once the cable is covered with the braided shield and the plugs wired (including the drain wires on each end connected to ground on the plugs) then the entire braided shield can be wrapped with two wraps of electrical tape. Now the cable isn't shown that way on the schematic (shielded) but examination of an original cable revealed that they were indeed shielded. It makes sense that they would have been because of the charging noise that would have been on the +28vdc buss system in an aircraft or vehicle installation. Why the schematic vaguely shows some "cross-hatching" on the cable that isn't connected to ground is a mystery. If you are using the PP-1104 power supply to power up the PE-73 dynamotor, remember that the +28vdc goes directly through the dynamotor terminals and relay up to the transmitter through the PL-61 connectors and the power cable. The cable should be shielded for best results and lowest noise emission. The remote cable (using the PL-64 connector) isn't necessary for operation but if you decide to use one for receiver remote standby function or side tone then this cable should also be shielded. If you are running a dynamotor-operated BC-348 with your BC-375 then its power cable (which is coming from the PP-1104 power supply) must also be shielded. This "ultra-shielding" precaution may not be necessary if you run the transmitter and receiver on batteries only - no charging. Pure DC won't radiate much, (only a static field.) However, if you can run a high current power supply like the PP-1104, you'll have to shield as much of the power cabling as is possible to keep the radiated noise (RFI) at a low level. NOTE: Most of the RFI noise from the PP-1104 is from the magnetic current amplifier. The PP-1104 is not a switching power supply but it can generate some RFI. There are simple cures that involve better conductive mounting of the back panel and top the provides better shielding and also simple filters on the AC line and the outputs will all but eliminate the RFI issue. I've included a short article on the PP-1104-C power supply at the end of this article. Dynamic Neutralization - Probably the Most Important Step - The BC-375 is usually found without its matching serial number Tuning Units. This means that the "orphan" TUs were neutralized to a different BC-375 and will require neutralization to your BC-375. Any non-matching serial number TU that are to be used absolutely need to have their neutralization adjusted for minimum FMing. If the transmitter TU is not neutralized, then some minor parasitic feedback in the master oscillator will cause frequency instability, or FMing, causing more audio distortion. This parasitic feedback is made worst when the +HV is fluctuating with the load. The easiest neutralization method requires a receiver capable of FM detection that will tune to the BC-375 transmitter frequency. These types of receivers are always limited to more modern types of communications and SWL receivers. I use a Yaesu FRG-8800 which does have the capability of receiving FM on all frequencies. Tune in the transmitter's signal on the FM receiver and talk into the microphone. If the BC-375 is FM'ing, you will hear yourself quite easily. It's best to use earphones for monitoring. Adjust the TU neutralizing control until you no longer hear your voice modulation and the FM'ing and audio distortion should be at a minimum for that tuning unit at that frequency. You might have to adjust for the minimum audio response as voice peaks always seem to cause a little bit of FMing. The difference can be checked by switching the receiver over to AM detection and listening to yourself transmit. All of the "fuzzy" sounds should be gone and the AM signal should sound clear and intelligible. If you have the proper kind of FM detector-receiver, it's easy to check the neutralizing often and the results are simply amazing. There is no other easy way to set the neutralizing on the tuning units. NOTE 1: Even if you are using a +28vdc high current power source, you still need to do this neutralization to assure the transmitter doesn't distort because of parasitic oscillations. NOTE 2: I have tried other methods to set the neutralization for minimum FMing, like using a standard communications receiver with the BFO on and listen for deviations in the carrier frequency but this doesn't work at all. About the closest to FM monitoring is to use earphones to monitor your BC-375 AM signal on a standard communications receiver and adjust the neutralization for the best sounding audio. This will get you kind of close but not as close as the FM receiver does. Thanks to Tom Horsfall, WA6OPE for the dynamic neutralizing information using an HF FM receiver. Non-symmetrical Modulation - Though lack of serial number specific neutralization of the TUs is the most important step, another important problem is the inability of the transmitter to achieve symmetrical 100% modulation due to insufficient high voltage from the PE-73 because of its operation on +24vdc. In fact, due to the low +HV, 50% modulation is a common limit. To elaborate on the nonsymmetrical modulation, 100% positive modulation is next to impossible to achieve while 100% negative modulation seems rather easy. However, by reducing the loading to lower the output power, it is possible to improve the modulation symmetry. This reduced loading will also help the FMing problem. Usually a BC-375 can produce about 90 watts into a 50 ohm unbalanced load provided the tubes are fairly new and the transmitter is in good condition. At this level of power though, the load on the dynamotor is pretty high and since it is running on +24vdc, its RPM is too low for good stability. This results in severe FM'ing due to load fluctuation and the low +HV results in about 50% modulation. Most of your audio reports on VOICE will be "you sound terrible." A power output of about 50 to 55 watts will reduce the load on the dynamotor which reduces the FM'ing due to voltage fluctuations due to power load changes and this will improve the transmitter sound overall. Also, at the lower power level, the modulation level will be higher since the carrier envelope to be modulated is less. At 50 watts output power, 100% modulation is possible to achieve and with careful monitoring of the signal on an oscilloscope, negative modulation in excess of 100% can be avoided. Actually 100% negative is the limit, then you go into "cutoff" and that can be avoided with signal monitoring. So, the first thing to do is to reduce the output power to 50 watts. Remember, even though the carrier power is reduced your audio power is actually better (because of a higher modulation level) and overall your signal will be much more "powerful" sounding. The Microphone Choice is Important - Options - Carbon microphones used with the BC-375/BC-191 are another source of audio problems and this problem applies for both +24vdc or +28vdc operation. The T-17 or T-32 carbon microphones were standard equipment. The T-17 was designed to provide intelligible communications from a very noisy environment, so almost all T-17 mikes will be noise-cancelling in design and therefore very limited in response. A few very small openings in the mouth cup indicates a noise cancelling microphone. The T-32 looks like a "candlestick phone" and has a very large carbon button element. These mikes were commonly used with the BC-191. They can be a very good performing mike but many suffer from carbon packing, carbon fusing and other age-related and abuse-related problems. Typically, you'll find that almost all of the original carbon elements are practically non-functional nowadays, after all, they are pushing 70 years old! The usual procedure is to acquire as many T-17 mikes as you can and test them. After about a dozen or so, you'll find one that works well with lots of response. Be prepared to go through a lot of T-17s though. The small T-1 carbon replacement element can still be found in NOS packages and these usually will work fine too. Regular older telephone carbon mike elements work but will require testing to see if they will sound correct. Some do and some don't so testing is the only method to find out. There are carbon mike substitutes, like electret mikes. These were commonly used as carbon mike replacements in some modern telephone equipment and are very common in microphone applications for computer use. Electret microphones consist of a condenser mike with a small FET amplifier for the output. They require a small voltage to power the built-in FET amplifier and that can come from the BC-375 carbon bias. They can be a little noisy. You will also have to add a transistor amplifier circuit in with the electret mike to isolate the carbon mike bias line from the FET amp and to provide a low Z output with the BC-375 input transformer acting as the collector load on the transistor. This will provide plenty of audio since it is audio driven low-Z and right in the audio line just like a carbon mike. There are several Electret circuits shown on the web. If you are contemplating bypassing the bias voltage source and running an amplified mike directly to the audio input transformer - don't. The primary of the transformer is very low impedance, around 50 Z ohms or so. It is so low that it will limit any bass response in the mike and unless the mike is amplified you'll never have enough output for full modulation. Stay with the carbon mikes and try to find one with good response. The BC-375 was designed for a carbon mike and performs best using a carbon mike. Frequency Drift and CW Operation - The BC-375 will frequency drift rapidly as the frequency is increased. The higher the frequency of operation the more pronounced the drift will be. Generally, drift in the VOICE mode is much less noticeable since there isn't a specific tone heard as there is in CW reception. Expect drift above 4.0mc to increase and expect 40M operation to be next to impossible due to rapid frequency drift. Originally, when used by the military, the majority of operation of the BC-375 was in the CW mode and the transmissions were kept deliberately short - usually one word was all that was necessary to convey the message. Using CW and terse messages kept any productive information from an enemy intercept to a minimum. If your transmission is only a few seconds long your transmitter frequency doesn't have time drift very much. For typical airborne military operation frequency drift really wasn't an issue regardless of the operating frequency because of the brief transmissions. Today, hams usually want to use Voice mode and make transmissions that last several minutes. On 160M and on 75M this isn't a problem. Drift above 4.0mc will become a problem because of the length of time the transmitter is on. If you are contemplating 40M operation, you will need to make very short transmissions - 30 seconds would be about the maximum length before frequency drift becomes quite noticeable. Some users find that removing the tube cover plate will help with the drift since it keeps the temperature of the tubes cooler. Generally, drift problems are negligible on 160M and 80M but can make operation on 40M impossible. CW Operation - Using a BC-375 on CW will generally garner several comments relating to "chirp" or "blooping" of the CW note. Like drift, on 160M and 80M, the CW note is pretty good although there will be some noticeable blooping if the transmitter is operated using a battery-only set up. On 40M, the CW note is pretty bad with severe blooping accompanied by rapid frequency drift. The better your power source is the less likely that blooping will be noticed on 160M or 80M. On 40M, it doesn't seem to matter very much. Using a BC-191 and RA-34 combination will produce some ripple to the CW note due to the "split" 12 volt supplies in the RA-34 that power the BC-191 tube filaments with 12vac. It's not bad but it is noticeable. CW operation is accomplished by keying the PTT line operating the sending relay within the transmitter. This is rather noisy and unless a headset is used for reception (and sidetone) the racket can become irritating after awhile. Also, the sending relay limits the CW speed to 15 WPM or less. Again, during WWII and onboard the airplane the transmitter noise was masked by all of the other noises going on during flight. Also, short, one word CW transmissions didn't allow the radioman (who always used a headset) to notice the sending relay noise. Remote Standby and Sidetone interfaced with the BC-348 receiver, muting the receiver during transmit and providing the radioman a side tone for monitoring his CW sending (which was heard through his headset.) Remote mike and key along with remote power ON were to allow the airplane's pilot to access and transmit on the BC-375 from the pilot's seat - something that might be necessary if the radioman was unable to operate the transmitter. The pilot's position had a Remote Junction Box to provide the mike and key input along with the power ON control. Reference the BC-375-E military manual (Technical Order 08-10-139 is the manual number - original manuals were available from Fair Radio Sales) and the schematic for complete diagrams of the PL-64 connector in the transmitter and the PL-64 plug and cable assembly. You can make your PL-64 cable using multi-conductor shielded cable. Neither Remote Standby or Side Tone requires much current so fairly small conductors are okay. 22 gauge would be about the smallest that should be used. If you use a carbon mike for a remote mike, you don't have to shield it anymore than the cable shield. The carbon mike is very low impedance and fairly immune to RFI. Much of the BC-375's "bad reputation" was impart due to CQ magazine's "Surplus Conversion Handbook" assessment that transmitter was obsolete and only good for parts. Certainly the 1950s was a time when the bargain prices and unlimited availability of WWII surplus gear made it seem that "hacking up" an old relic didn't amount to much historical damage. After all, there were thousands available and they were cheap. CQ magazine was the main advocate for "modification mania" and convinced droves of hams that they could "out design, out engineer" and "knew more about radio" than the teams of professional radio engineers that were employed by some of the largest radio manufacturers in the world. This belief was further popularized by magazine articles featuring the latest "hack job" and with glowing reports of how great everything worked after a ham had performed his modifications. However, what had worked fairly well for the BC-348 and a few other military designs wasn't going to work for the BC-375. All attempts to modify the BC-375 into a usable ham transmitter failed - mainly because the transmitter was designed for a specific purpose in military aircraft or vehicular applications. No modifications seemed to work and since it was a simple MOPA military transmitter, in CQ's opinion, it was worthless. Remember though, CQ was advocating that the BC-375 should perform like a ham transmitter and not that it didn't perform like a military transmitter. Since it couldn't be modified to function as a ham transmitter it must only be good for parts. If one believes that the WWII radio engineering teams "knew what they were doing" and designed the BC-375 to function properly without distortion or instability. If one knows that the transmitter was successfully used by the military for two decades and that must account for performance that was acceptable. Then the BC-375 performance problems must be rooted with how the 1950s hams were trying to operate the transmitter. I decided to try and operate the BC-375 as closely as possible to specifications and at the proper input voltage and current levels and see what kind of performance would result. As a power source I chose the PP-1104-C high current adjustable power supply. The PP-1104 will supply well over 50 amps at +28vdc - nearly double the current requirement for the BC-375 operated by the PE-73 dynamotor. I also chose to run the voltage slightly higher (at +28.5vdc) as it seems likely that the battery-charger buss on the airplane would be on "the high side" with the airplane aloft and running "at speed." Next, I had to neutralize the Tuning Unit because it was not a matching serial number TU but was an "orphan" TU that was obtained separate from the transmitter. Since this TU had been neutralized to a different BC-375, it would have to be neutralized again to my BC-375. I performed a dynamic neutralization on this TU. All power cables to both the transmitter and the receiver (BC-348-Q) were shielded. I believe the original cables were shielded but this is not shown on the schematics. Most transmitters are found without cables today. The shielding prevents stray pick-up and stray radiation. A good earth ground helps too, although while aloft a good ground is hard to obtain! The airplane frame acted as a return ground for all of the equipment and as a counterpoise to the trailing wire antenna, basically an unbalanced end fed wire. However, I was going to be using a tuned dipole presenting a 50 Z ohm unbalanced load with very little reactance (mostly resistance.) A digital frequency counter was used to monitor frequency and an oscilloscope was used to monitor modulation. So that was the set-up. Testing with local monitoring showed that 100% modulation was easy to obtain with good condition microphones. Typical was about 90% modulation using a T-17 microphone with the audio gain set to 8. A more modern Shure102-C carbon mike achieved 100% negative modulation with the audio gain set to just 6.5. The wave envelope pattern viewed on the oscilloscope was symmetrical and 100% positive modulation was also apparent. No FMing was detectable unless the local receiver BFO was turned on and then only a very slight frequency excursion was noticed on some voice peaks. Without the BFO on, no FMing was detectable. Power output was running at 75 watts carrier power output. Audio quality monitored locally using an SP-600 receiver with a headset sounded very good with all of the characteristics expected from a carbon mike. I set up an impromptu "on the air" test after one of the Sunday morning Vintage Military Radio Nets on 75 meters (3974 kc.) This allowed me to have about six or seven ham military radio enthusiasts critically listen to my BC-375's signal. My test transmissions were copied by all of the participants most of whom were around 150 to 200 miles away. All comments were very positive with "I would have never guessed that was a BC-375" being the typical reply. Additionally, none of the stations detected any FMing unless they switched on their receiver's BFO and then the FMing was only slight and only on some voice peaks. The point of this experiment was the demonstrate that there is nothing wrong with the BC-375 design. If the transmitter is powered up with the same voltage and current capabilities that were found on the airplane and if it is operated in the manner that it was intended, it performs admirably. Now it certainly won't pass the "Broadcast Audio" test because it isn't that kind of transmitter. A properly powered BC-375 will produce "communications grade" audio with no distortion and, of course, it will have the typical "carbon mike" sound. That's normal and what should be expected from the BC-375. UPDATE - October 12, 2013 - To prove to myself that the results of this test were not specific to my BC-375 transmitter, I performed another test using KØDWC's BC-375 transmitter. 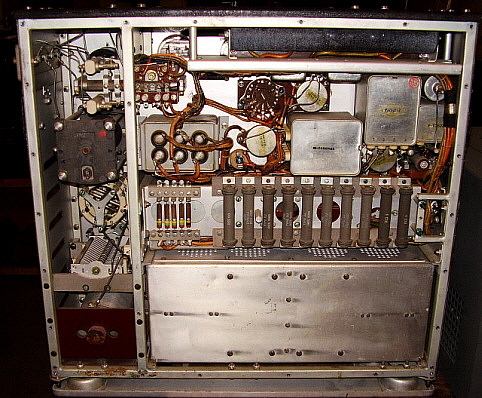 The KØDWC BC-375 needed to have its TU-6 Tuning Unit dynamically neutralized and the microphone gain needed adjustment but everything else was fine with this transmitter. The transmitter was at my QTH in Dayton, Nevada, so I was using my PP-1104 for the power source, my shielded cables, my Shure 102-C microphone and my antenna-ground system. I was operating the KØDWC BC-375 at 75 watts of carrier power output. This time, rather than testing after the Net, I just checked in using the KØDWC BC-375. The reports back from the other Net check-ins were the same as the previous test with my BC-375. Typical comments being "I'd have never guessed that was a BC-375. It sounds great!" and "Only a very slight frequency change and only on some voice peaks." I think this is pretty convincing evidence that, when operated at +28.5vdc with 50+ amps current availability along with dynamic neutralization of the TU, shielded power cables and a good condition carbon mike, the BC-375 is capable of good quality military communications audio at a respectable power level. 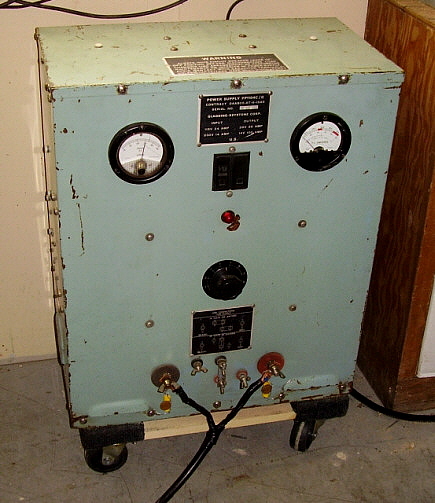 The PP-1104 was originally supplied to the military as part of a battery charging system. To say that the power supply is robust is an understatement. It is capable of supplying well over 50 Amps at 28vdc and has the ability to adjust the output voltage to compensate for the load. There are two versions of the PP-1104, the early version that uses a large selenium rectifier and the later version that uses silicon diodes. Both have similar performance specifications. Early versions are designated as PP-1104-A/B and later versions are designated as PP-1104-C. Many different contractors have built these power supplies over many years so there are variations galore as to minor construction details and paint colors, etc., but the specifications and performance are all the same. The physical size of the PP-1104 is about 24" tall by about 20" wide by about 12" deep. The weight is over 100 lbs for the early versions and just at 100 lbs for the later versions. The power requirements are either 115vac or 230vac with the current draw at between 10 amps to 24 amps depending on the ac voltage used and the load. The power supply can also be set up for 12vdc at over 100amps capability. The circuit uses two 12vdc solid-state linear power supplies that can be connected in parallel or in series via front panel links. Meters provide constant monitoring of output voltage and current. A front panel switch allows for setting the output voltage in roughly 10 steps. Output voltage should not be adjusted with the unit turned on however. Set with power off and then check with power on. The circuit on the later PP-1104 supplies uses a magnetic amplifier to increase the current capabilities. Curing RFI in the PP-1104 - Some PP-1104-C versions are rather noisy in the RF spectrum, mainly due to the magnetic amplifier that will produce some RFI. The PP-1104-C can be set-up with shielded AC lines coming in and shielded cables for the output. Be sure that the case of the power supply is also connected directly to the station ground system with a 10 ga. ground wire. Additionally, it's a good idea to bypass the AC line in with .01uf capacitors to chassis and to also bypass both the positive and negative output terminals with a .22uf tubular and a .01uf ceramic disk capacitor connected in parallel to chassis. Be sure to check the 10-32 screws that mount the top cover, the bottom and the back cover to see if good grounding contact is being achieved. Usually the paint is very heavily applied and quite hard and this sometimes insulates the covers from making good contact to the main frame. It's usually necessary to use a small sanding disk to remove the paint where each screw head makes contact and remount the screws using toothed lock washers. This will provide an "RF tight" enclosure which helps considerably in reducing RF noise. Thanks to Jerry Fuller W6JRY for the PP-1104-C RFI suggestions. PP-1104 Operation - Using the PP-1104 to operate dynamotors eliminates most of the headaches since the power supply is capable of providing the required starting current without hesitation. Also, since the PP-1104-C can be adjusted to over 40vdc output voltage, adjusting to 28vdc under load is easy and allows the BC-375 (or any other DC operated military transmitter) to run efficiently and with maximum RF output power (around 75 watts output typically for the BC-375.) The usual load at +28.5vdc input for a BC-375 is about 8 amps in standby and about 25 amps during transmit. The BC-348 receiver will add another 2 amps making the total current draw for the BC-375 and BC-348 about 27 amps with some increases in current demand with voice peaks. Be aware the the "starting current" on any dynamotor is much higher than the "at speed" current. Typically the BC-375 will "peg" the current meter for an instant as the dynamotor begins to rotate. As soon as rotation begins the current requirement drops rapidly and the dynamotor attains full RPM in less than half a second. Since the PP-1104 is a linear power supply, it can easily handle the short duration 100+ amps starting current. Another PP-1104-C Suggestion - In looking at the photo of my PP-1104-C above you will probably see that I have it setting on a small furniture dolly. I bought the small dolly at Harbor Freight Tools but I think they are available at almost any large hardware or tool store. The small dolly is a perfect fit for the PP-1104 and allows it to be moved around the shop with ease. As if all of the above wasn't enough to deal with,...now the 211E/VT-4C has become an Audiophile tube! What's Going On with 211E/VT-4C Prices? - Anyone who looks at eBay once in a while may have noticed that the current prices of 211E/VT-4C have "sky rocketed" to the point of insanity. The 10Y/VT-25 price is also on the increase. The question is why? Asian audiophile dealers, in their quest for audio amplifiers with low distortion using high power triodes have come up with a couple of custom-built mono-block audio amps that use push-pull 211E tubes. The more exotic version of the amp even has analog meters. The photos on eBay show the amps equipped with United Electronics versions of the 211E. As a result of these amplifiers, the prices of 211E, especially the United versions, have gone insane. The 10Y/VT-25 prices have also gone up because it is a four-pin triode and as a result it is lumped in with all four pin triodes whether specifically for audio or not. With prices for a set of four GE 211E/VT-4C tubes exceeding $1000 and the price of a 10Y going over $100, it becomes almost impossible to find a BC-375 or BC-191 that still has its set of tubes and is priced reasonably. >>> >>> Unfortunately, most BC-375s for sale today are minus the tubes. When one considers that a set of tubes could easily exceed $1000, it becomes unlikely that a "tubeless" BC-375 would even be sellable. This then makes it likely that today a "complete with tubes" BC-375 would be priced so high that only a tube dealer could afford the purchase and the dealer's purchase-motivation would be in order to "pull and sell" the tubes on eBay. Eventually, all there will be is bargain-priced, "tubeless" BC-375s. Maybe, good for parts but who will be able to afford the tubes to get them running again? As an illustration of this problem, I recently (Oct 2015) purchased a very nice BC-375 with no tubes (plus, it included two TUs.) The price was ten dollars! This transmitter had been available for a couple of months at a local electronics surplus dealer. He had earlier pulled the tubes and sold those on eBay. He then couldn't find anyone interested in purchasing the now incomplete transmitter. It became a "parts sets" just because of the "eBay prices" on the 211Es. Will this be the fate of most BC-375s from now on? What does it mean for your operating BC-375? Well,...be careful. Don't run excessive power and make sure that a good, non-reactive load (antenna or dummy load) is always presented to the output. Be sure the filament links are set for 10vdc with the power supply that is used. All of these are pretty normal operation for preserving the tubes. Don't worry about "wearing out" a good set of tubes - they will last your lifetime if operated conservatively. 1. Reduce power output to around 50 watts, 60 watts maximum, if operating on a +24vdc battery set-up. This will improve modulation symmetry. You can increase the power to 65 watts for operation of the BC-191 on the RA-34 power supply. If running a BC-375 on a high-current +28vdc power source, RF power can be increased to 75 watts. 2. Dynamically Neutralize the TU at the frequency you intend to operate the transmitter. This is the most important step for "clean sounding" audio without the typical BC-375 "fuzzy" sound. This step is necessary no matter how you are powering the transmitter. If you have "matching" TUs for the transmitter, that is, the serial numbers all match indicating that the TU to be used is the original one for the transmitter, you might find that the neutralization is very close already. However, it's very strongly recommended that the neutralization be set by the "dynamic" method, even on matching TUs, to assure the absolute best sounding and cleanest audio from your BC-375. 3. Find a high quality Carbon Microphone or use an Electret substitute. Quality sound will usually require a new Carbon element in order to have the response necessary for good audio modulation. Remember, we are trying to achieve "clean" audio with the "military" sound - not Broadcast Quality audio. If you're looking for Broadcast audio, you'll never find it in a BC-375 or BC-191. 4. Make sure your Battery-Dynamotor set-up is operating correctly and that the batteries are at full charge. Batteries alone will not supply +28vdc power. Without the charger system (that was always running when the airplane was aloft - or the vehicle motor running in the case of the BC-191) the batteries by themselves will very rapidly discharge. Additionally, at full charge the batteries alone will only supply about +26vdc maximum and that begins to decrease immediately with the transmitter in operation. Typical batteries will provide +24vdc for the majority of your operation. Turn off the BC-375 between transmissions to conserve the battery's charge as much as possible. This would be for net operation only and probably not practical for a "one-on-one" QSO. You can also parallel a DC power supply that can somewhat act like a generator, providing charging while operating the transmitter. The power supply should be capable of at least +30vdc and have current capability in excess of 40 amps but even if you can't supply that much current, 10 amps or so will help keep your batteries charged while you're in the receive mode. 5. The BC-375 runs much better at +28vdc. Use of a high current power supply such as the PP-1104 will allow the BC-375 to operate at +28vdc with ample current reserve. It's been my experience that when the BC-375 is run at a solid +28vdc you can increase power output to 75 watts without non-symmetrical modulation appearing and your signal won't FM - at least on 160 meters or 75 meters, it won't. Since the dynamotor is operating to spec, the output voltage is in excess of +1000vdc and because the dynamotor is running faster with plenty of reserve current, that +1000vdc is pretty stable to load variations, thus the lack of FMing and better all around performance. Dynamic neutralization is still necessary, though. 6. The BC-191 can be operated with its specific military AC power supply, the RA-34, which eliminates the need for batteries and the dynamotor. The RA-34 will not operate a BC-375 however due to its +12 volt LV design and the different wiring of the low voltage section of the transmitter. The RA-34 provides dual 12 volt supplies (both AC and DC) that power different sections of the BC-191 transmitter (AC to the tube filaments, DC for the other LV requirements.) The BC-375 design ties these two low voltage sections together in parallel and runs them on +28vdc with dropping resistors as needed. The RA-34 will provide stable, quite operation of the BC-191 but the RA-34 does have a quirk or two. If you use a BC-191 and RA-34 combo on CW you'll have quite a bit of ripple on the CW note since parts of the transmitter are being operated with 12VAC. It's likely that the majority of military operations using the BC-191 were on VOICE, so the minor ripple on a rarely used CW mode didn't bother the Army. It was still readable, but be prepared for critiques when operating CW with a BC-191 and RA-34 combo. More than likely, you're going to have to be careful on VOICE and don't try to load the transmitter to maximum output. You usually can run the BC-191/RA-34 combo at about 65 watts output without any problems. With these steps, your BC-375/BC-191 will sound about as good as it can. 2. Thanks to Tom Horsfall WA6OPE, Jerry Fuller W6JRY, Dennis Duval W7QHO, Jack Antonio WA7DIA, Chuck Cusick KØDWC and many other WWII military radio enthusiasts for their contributions and suggestions that have ultimately resulted in the BC-375 and BC-191 transmitters becoming good-sounding, usable military transmitting equipment.